Exit Piccadilly Circus Station and head towards Great Windmill Street and The London Pavillion. Head up Great Windmill Street onto Shaftesbury Avenue. Stay on Shaftesbury Avenue until you reach the Lyric Theatre on your left hand side. This is approximately a 2 minute walk. Age restrictions: Children aged 4 and under will not be permitted. Thriller Live is the brilliantly energetic tribute to Michael Jackson's musical legacy - with a career spanning 40 years, get ready to sing along with 35 of his best loved and biggest hits! Featuring a live band and over 20 performers, as well as a full company of singers and dancers, this high-octane show delivers an experience never to forget. With director and choreographer Gary Lloyds' spectacular dance routines showcasing moves from break-dancing to gravity defying leaps from an on-stage bridge - and of course the moonwalk, together with the fabulous range of multi-media effects the cast really bring a feel of Jackson's legendary live performances to the West End. Including numbers from the early days in the Jackson 5 all the way through to his last solo works, this 2 ½ hour show is a celebration of a ground breaking artist who changed the face of music. Please note - Contains constant use of flashing LED screen and some strobe lighting. 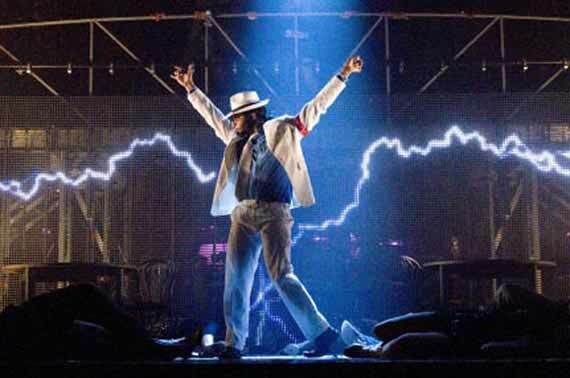 Originally created by Adrian Grant, family friend and author of Michael Jackson- The Visual Documentary, Thriller Live has come a long way, having recently celebrated its sixth birthday in London's Lyric Theatre. Named after Jackson's biggest hit, which still remains the world's best-selling record of all time at over 750 million copies, the show has played over 3000 times globally to 2.5 million fans. Having already been performed in Germany, Scandinavia and the Netherlands, as well as completing 3 tours of the UK, Thriller Live then arrived at the Lyric Theatre where it has been wowing fans ever since. Following further worldwide tours, reaching as far as Australia and China, the craze around this show doesn't look set to end any time soon! 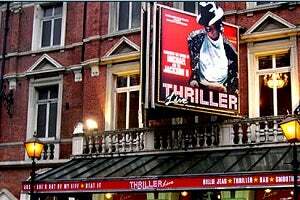 Why book London Theatre Breaks to see Thriller Live? When you could save up to 75% by booking your Thriller Live tickets and hotel stay through Hotel Direct, it can be too good an opportunity to miss - partying along with the King of Pop! For an even better experience why not give us a call and we can help tailor a package especially for you. Critics raved when Thriller Live first opened in the West End's Lyric Theatre in 2009 and haven't stopped since, with lead singer Cleo Higgins being nominated for Best West End Debut in the West End Frame awards, Thriller Live is still going strong. Thriller Live entered the record books when it became the longest running show in the Lyric Theatres' 125 year history. The show has now received standing ovations in 28 countries from South America to South Korea. Gary Lloyd doubles as director and choreographer and has previously worked with artists including Robbie Williams and Girls Aloud, the show also features additional choreography from five-time MTV award winner LaVelle Smith Jnr. "Absolutely amazing show. The singing and dancing was second to none. Totally recommend." "Wasn`t sure what to expect, was pleasantly surprised. The show got better and better as it went on. Full of energy, full of fun, great singing and amazing dancing from the cast. The whole show was put together really well from beginning to end. Song choice was spot on, includes all the big hits. It`s a celebration of Michael Jackson the artist. You won`t be disappointed!" "Fabulous show can`t fault it in any way!" "The show was great my wife and I really enjoyed it. The theatre is fairly small so wherever you sit you will have a great view." Thriller Live Rating:	93%	out of	100	based on	980	reviews.